Many new phones keeping showing up, some users can't wait to get the newest one, may be you are on of those users. But you must ask how will you deal with your old Android phone? Are you thinking of selling it, give your own phone to a friend, trade it on eBay, or donate it to a charitable institution? You do not want your private and confidential data to fall in someone else’s hands and be misused, right? The best practice is to delete everything and then give your phone away. Most people probably think that performing a factory reset on Android device is enough. However, they are wrong. All the original data on a factory resetting phone can be easily recovered by third-party data recovery software. This fact makes it very important for you to completely and permanently erase all data from your phone. When will you need to use Coolmuster Android Eraser? Buying a new phone and selling your old one (The most common reason). Getting rid of your SD card or giving it to someone else, you need to erase the card completely. Format the phone in case of software errors or if your phone get attacked by virus and then it is best to erase it completely to remove the virus effectively. If you need more space on our phone or become bored with the media files on it. Permanently wipe out all data from Android device, including the deleted files, private data, system settings, etc. Support all kinds of Android files, including text messages, contacts, videos, photos, music, call logs, apps, books, audios, account info, password, etc. 3 progressive levels of data erasing for your choice. Work with all Android devices like Samsung, Huawei, Xiaomi, HTC, LG, ZTE, Motorola, etc. Easy to Use: Concise user interface and step by step wizard make even computer novice can handle this software without any trouble. It only requires a few clicks to wipe out everything your Android device. All Windows Platforms Supported: Work well on all Windows platforms, including Windows 10/8/7/XP/Vista/ 2003/2000/NT. Standalone: Do NOT need any other third-party program while you're running this program. 1. 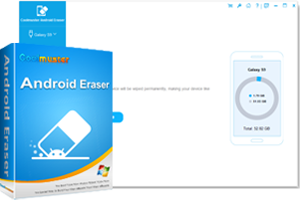 Reply below why you need to win a license for Coolmuster android eraser? I just want to give it a try. Thanks and have a great day. Thanks for the opportunity in this giveaway @tarekma7! This software will help me to return my android phone to clean state and delete data permanently especially private data. I want to have this program to clean the smartphone before transfer as a gift. I have a very old Android phone that has been around way too long. I want to donate it to a charitable organization however I want to use Coolmuster Android Eraser to make sure the phone is safely and completely erased (returned to a "Clean State") before I do. I have already posted in the topic. I want the software if available.